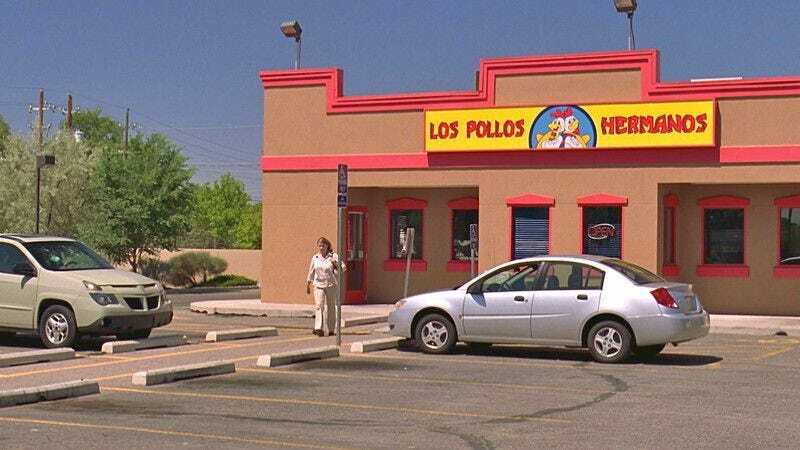 Vince Gilligan has teased the possibility of a real-life Los Pollos Hermanos—the delicious-looking chicken restaurant ruled with a politely smiling iron fist by Breaking Bad breakout character Gus Fring—before. Now, AMC has made that gently battered dream a reality, building a real-life version of the store as a “pop-up activation” (ugh) at this year’s SXSW. It’s all part of the network’s ongoing efforts to remind us all that Giancarlo Esposito’s box cutter-wielding boss will be returning to the franchise when Better Call Saul comes back for its third season next month. Bafflingly, the restaurant doesn’t seem to be serving any actual fried chicken; instead, they’re offering up the curly fries that were teased in a recent stealth promo for the show. (That being said, at least they’re free, and it’s not like LPH is somewhere where you want to be complaining to the management.) AMC is also offering a chance to fill out a “job application” to work at the restaurant, which is actually a contest entry for a meet-and-greet with Esposito and Bob Odenkirk to be held at the restaurant later this week.